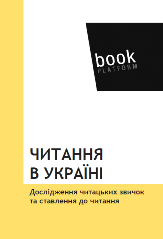 The results of the general national representative study of reading habits and attitude to reading undertaken by pro.mova experts to order and in partnership with the NGO Publishers Forum at the turn of 2013-2014 within the Book Platform project have identified certain trends in the development of an important cultural practice form for modern Ukrainians, which is reading. The principal difference between this study and previous studies consists in the fact that it focuses on various reading practices – not only books or periodicals, but text/s in general (of any size and broad content). Readership and reading policy document not showing on this page.